Pictured: The TATA Xenon range. TATA Motors, Australia’s exciting new light commercial brand, has announced a factory bonus program across its entire Xenon range. ‘Pick Up a Factory Bonus’ rewards buyers with up to $2,000 cashback on some models, with the price-leading single cab-chassis 4x2 now starting at just $19,990 driveaway. 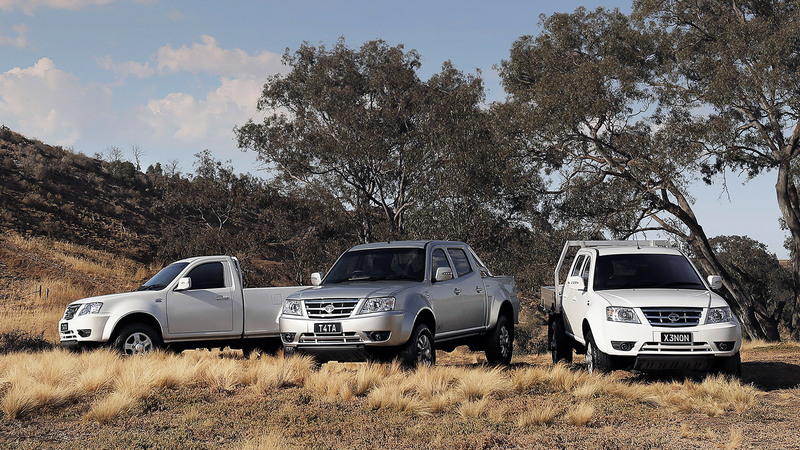 The six model Xenon line-up includes both single and dual cab models in both cab-chassis and pick up body styles. The Xenon is available in 4x2 and 4x4 configuration and is powered by a 2.2 litre DOHC, Euro 5 emission compliant, turbo diesel engine that produces 110kW and impressive maximum torque of 320Nm, that starts at just 1500rpm - providing excellent driveability and towing capability. It’s also very economical, using just 7.4L/100km (combined cycle). The Xenon range has a towing capacity of 2500kgs and can carry a payload of up to 1080kgs, making it a favourite with tradies. Interior features across all models include USB input, ipod connectivity, Bluetooth capability AM/FM radio and CD player, with dual cab models also having sat nav and reverse camera as standard. The Xenon also has ABS brakes, dual front airbags, central locking and remote keyless entry. The ‘Pick Up a Factory Bonus’ program runs until 7th September 2014.